Wahlburgers is one of my favorite TV shows, so this week I decided to make a Wahlberg family classic. On their show, the mom of all of the boys (Alma) explained how she had to make budget friendly meals every night for the kids. The chef in charge of the Wahlburgers restaurant (Paul Wahlberg) always says in the intro to the show that they were very poor people when he was growing up. In order be able to eat food every night, Alma had to cook simple and cheap recipes. On the Wahlburgers show, the Wahlberg boys always talk about their mom’s American Chop Suey. I had never had chop suey before in my life… so I thought that it was just some crazy mixture of meats and whatever the heck suey is. And oh, how terribly wrong I was! 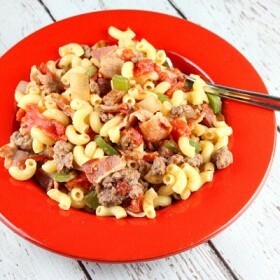 American Chop Suey is a bunch of meats and noodles and vegetables thrown into a dish. Although the dish tastes AMAZING… I wondered if I could create a better name for it. I pondered the thought for almost an hour, when an idea struck me. I knew the answer. I should call it: Beef with Bacon and Vegetables with Noodles. Great name right? I had just watched an episode of the Walking Dead (the newest addition to my favorite current TV shows) prior to making the American Chop Suey, so cutting the bacon up and tearing the beef felt so much like zombie guts! 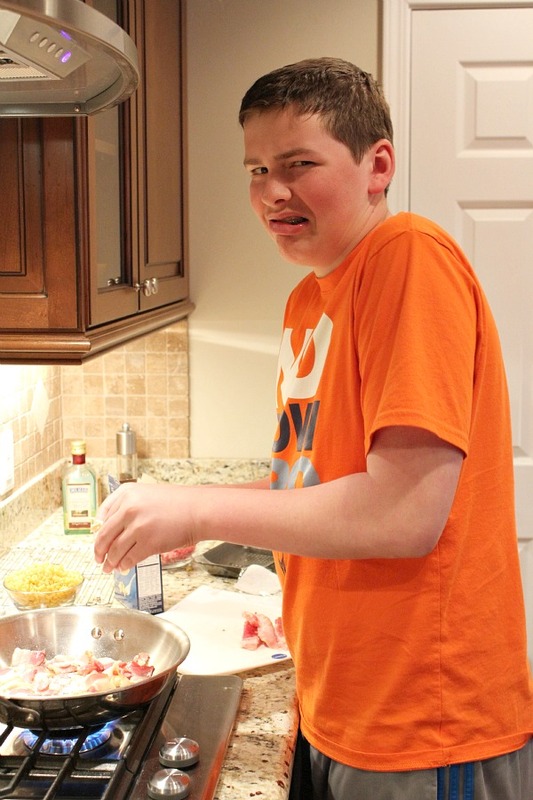 I was so disgusted. It was not a fun experience. Not fun at ALL! My oh my. What could get better than this? 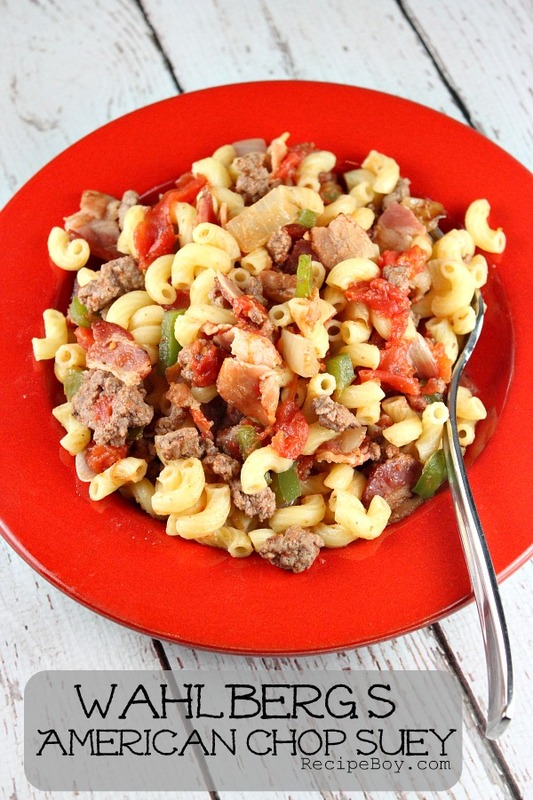 This American Chop Suey is amazing (no matter what type of budget you have). This summer when my family goes to Massachusetts for our usual vacation, I’m definitely going to Wahlburgers Burger Restaurant. Maybe I can even get an interview set up with Paul Wahlberg (the head chef)! That would be the best if I could actually tour the facility and interview Paul Wahlberg! Meeting the Wahlbergs would just be such a cool experience. These guys went from nothing in their youth to practically everything nowadays! I want to take a huge bite of chop suey right now. I don’t care if I eat part of the wooden spoon, I just want some of that chop suey. I’m very surprised that I’m not drooling in this picture. I wouldn’t be surprised if I started drooling when there is a whole spoonful of chop suey right next to my face! I’m pretty sure everyone would be wowed by this chop suey. 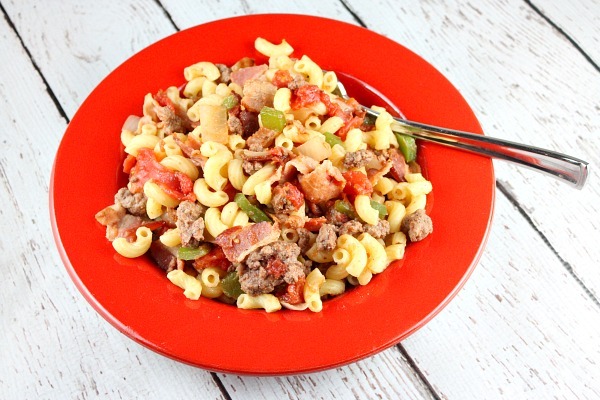 This Wahlberg’s American Chop Suey is the best! It’s sort of like a crock-pot recipe but without the crock-pot. I love the style of just basically throwing everything into a pot and letting it cook. 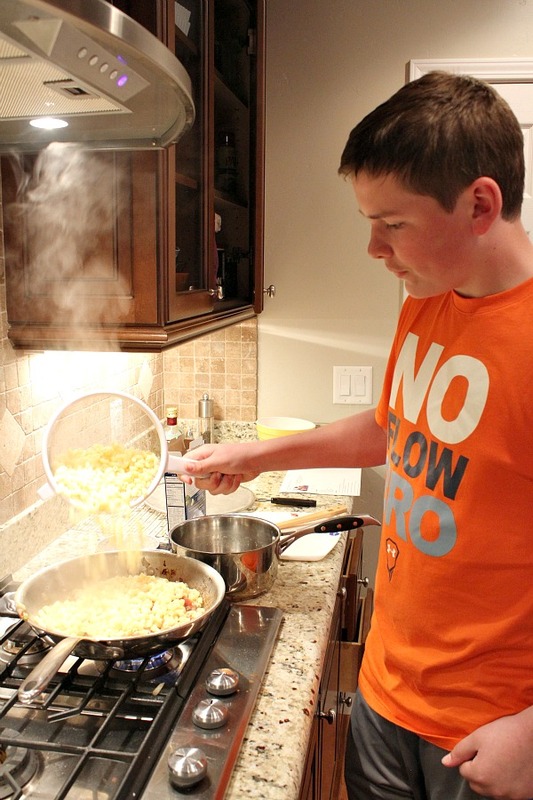 And even a kid can cook a recipe featured a million times on a TV show… Like Me! Click below to watch a short video showing you how to make this recipe, then scroll to the bottom to print out the recipe and make it at home. If you’re looking for more easy dinner recipes, you might want to try my Easy Chicken Chow Mein or my Pizza Sloppy Joes. These BBQ Chicken Tostadas look pretty amazing too! A famous, delicious recipe from one of my favorite TV shows! In a large pot, cook the bacon until it's half-way cooked. Tilt the pan and spoon out all of the fat except for about 1 tablespoon. Add the ground beef, onions, bell peppers, garlic powder, salt and pepper. Cook, stirring occasionally, until the meat is totally cooked. Add the tomatoes and crush them by hand in the pot. Stir in the cooked pasta and heat everything entirely. Serve! I saw that episode and wondered about this. It sounded good but i didn’t see a good enough picture of it until now to want to make it. Thanks for making and posting- it looks great! Loved this post! Yep, I watch the show too and they did have a pretty poor upbringing. But I guess you have to be creative with not a lot of money and lots of mouths to feed! 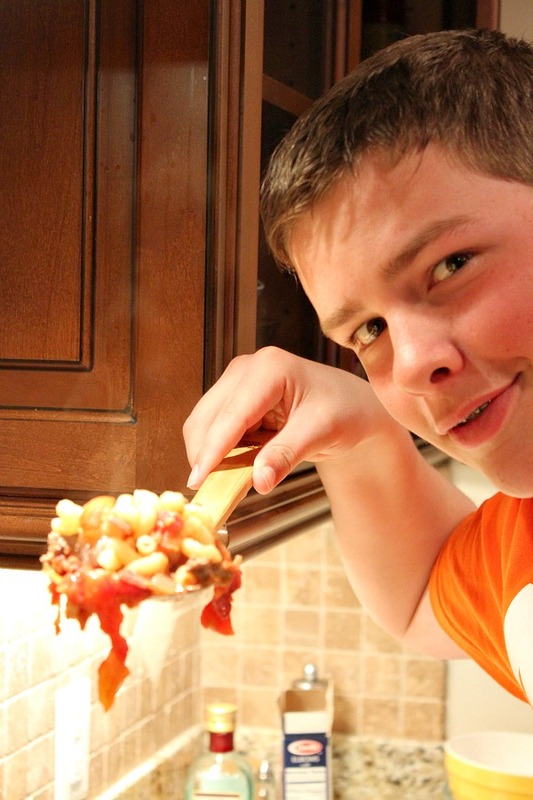 We had 9-children growing up in our family too, and we made this only we called beef-a-roni. I love the Wahlberger show…an interview with Paul would be so fun hope you can arrange it….just make sure to stay away from Nacho he’s a little strange. I have a box of lonely elbows that need to be dressed up like this. On a different note, I’m so impressed that all these culinary creations were produced by such young talent!!! I grew up in Mass and American Chop Suey was a staple. Fed a lot of people cheaply and kids loved it. But of all the recipes I’ve eaten I don’t remember any having bacon in it. Sort of scared to try that. I love bacon, but not with everything. 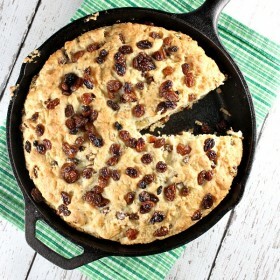 Same here, grew up eating this and still make it but without the bacon. I love American Chop Suey. Maybe I’ll try the bacon, why not? Agreed. Bacon is just not a typical ingredient. I didn’t see the episode myself but this was a weekly staple if not twice a week sometimes in our home. I thought it was a ‘poor people’ dish myself! as we grew up in poverty as well? but maybe it’s a Massachusetts thing! Making it tonight, sans bacon. Will be calling momma for her recipe! My cousin, from Vancouver, Washington, would call this Spaghetto because only the poor used hamburger, the rich got to use sausage. In Portland, Oregon, across the Columbia River from Vancouver USA, we call is Hungarian Goulash. Don’t know why. I’m from Massachusetts & my mom made it probably at least twice a month. We called it Goulash. My husband’s family, also from MA calls it Concoction-bet you never heard that before! We each make it slightly different. No bacon in either one though. I’m craving it now! Made this for dinner tonight for the family & they loved it, so I will make this again. It’s a very easy recipe and doesn’t take much time. The only thing I did differently was I added about 1/2 cup of tomato juice only because it looked a little dry and I added fresh garlic to it. We love garlic so wanted to add that to this dish. I also, substituted garlic salt for reg. salt. I am from Vermont and we called it goulash also. We didn’t put bacon in it either. We didn’t have money either , but we still loved it and I still make it. Great stuff!!!! I am from Michigan and much like everyone else commenting, we were poor, called it goulash, and did not put bacon in. Sometimes my mom would put cheese on it if we had shredded stuff laying around. It was a staple in our house along right along with S.O.S. 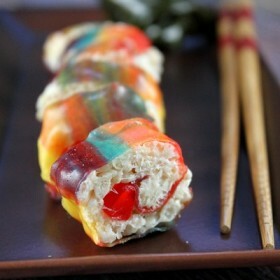 Making this tonight!!!!! Looooove it!!!!! I added some regular spaghetti sauce for color. This is our version of “GOULASH”, minus the bacon. My parents have made this dish for over 80 years. And since passed the recipe down to family. Very delicious and satisfying meal. I’ve seen this served on Wahlbergers and how everyone, including the crew goes crazy for it so I thought I’ll try it. I grew up in New Jersey, however we spent every summer in Maine and most of my friends were Mass and they did cook a little different than my Mom. I wanted to add something “new” for dinner and I made this recipe. I found it tasteless, and boring. If I ever make it again I know what needs to be “tweaked”. Also the recipe needs to show if I am adding the whole can of tomato, juice and all or if I am draining them. Sorry you did not like it- the recipe comes from Alma Wahlberger herself. Tomatoes are added to the recipe, juice and all (otherwise, I would have stated to drain the tomatoes). I’d be interested to know what you plan to do to tweak it so we can try that! I grew up in Michigan (and poor too) but we call it goulash (GOO-losh) and I make it for my kids now. We put a little parmesan on top. I add crushed red pepper on mine. 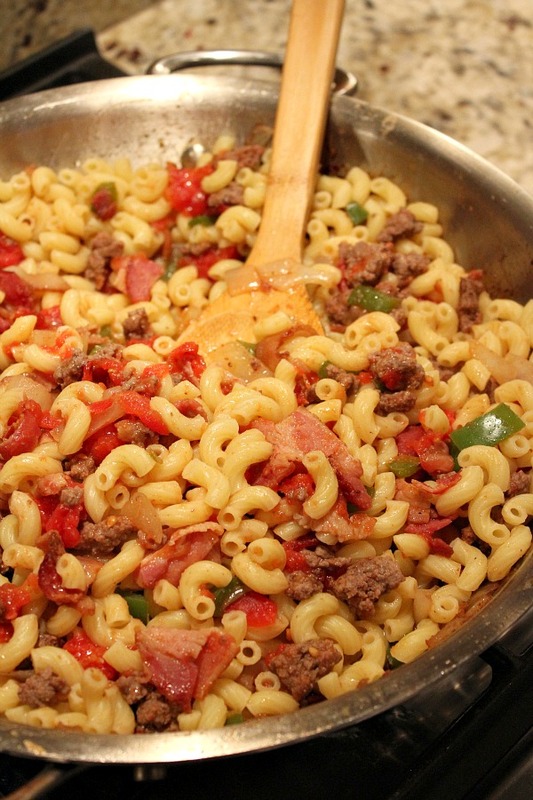 I also grew up in MA and my Nana and Mom made American Chop Suey without the peppers. When it as all cooked we put it in the oven and laid uncooked bacon pieces across the top and baked it, covered, for about 30 minutes. When it came out of the oven, the bacon would barely be cooked, still a little on the limp side, but delicious.